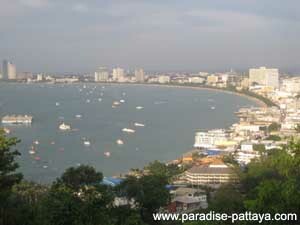 Check out some cultural things to do in Pattaya. and all the things that the city is known for to most visitors. Discover the things that most people never get to see. Pattaya is a party town but when you get tired of parties in Pattaya...take your family or your Thai Girl friend and visit some places. Thai girls like that too. It's a great way to get to know the Thai Culture. 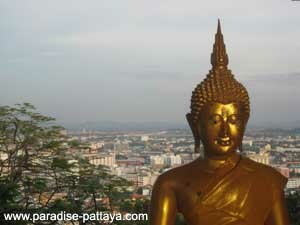 The Viewpoint is close to Pattaya Big Buddha and you could visit both places easily in a couple of hours when you are in the city. On weekends you will meet a lot of Thai tourists up there as well. One of the main attractions up there is a statue of 'Admiral Krom Luang Jumborn Khet Udomsakdi'. 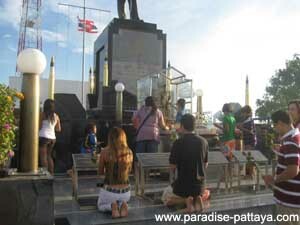 Thai people pay honor to him. He was the Prince of Jumborn who lived in the late 1800's and early 1900's. From the viewpoint you have a stunning view of the city's skyline which you may have seen on other pictures. So don't forget your camera since you will be able to take some very nice shots of the city. The radio station 104.75 is also broad casting from the viewpoint and has its station up there. When you drive back down from the viewpoint you may also want to check out the area around 'PEACH' (Pattaya Exhibition and Convention Hall) which is close by and right by Pattaya Royal Cliff Resort. There are nice parks with beautiful views of the city and an awesome view of the Bay.